Fun With Puzzles Brain Teasers Find the Mistake Observation Test Picture Puzzles Puzzles Puzzles for Adults If you are Genius Find the Mistake in this Demon Solitaire Card Game!!! If you are Genius Find the Mistake in this Demon Solitaire Card Game!!! This Mistake Finding Picture Puzzle is for Genius People. In this Mistake Finding Puzzle, there is simple picture of snapshot taken from Demon Solitaire Card Game. However there is one mistake in this given puzzle image. Only genius people with an eagle eye will be able to find this mistake. 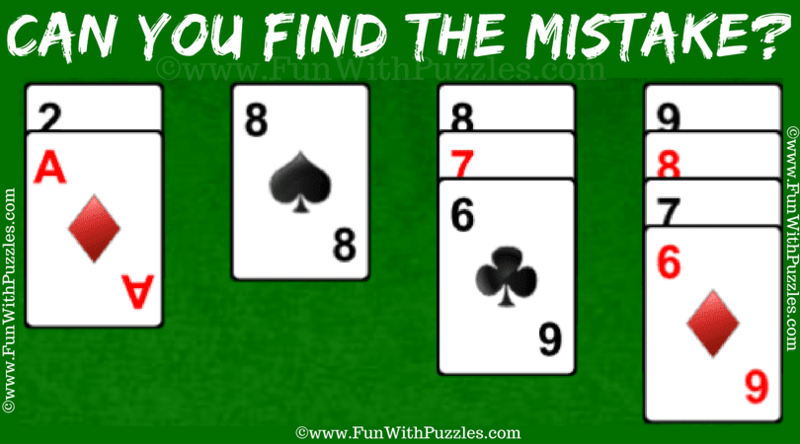 Lets see if you can find the mistake without looking at the answer of this mistake puzzle? If you are Genius Find the Mistake in this Picture? Answer of this "Genius Mistake Finding Puzzle", can be viewed by clicking on button. Please do give your best try before looking at the answer. The Answer is marked as below in the picture puzzle. Orientation of the marked 8 is same as upper 8. In a card orientation of number/letter at upper left and lower right is 180 degree rotation of that number/letter.